I have read all of Jeff Shaara’s historical fiction books. I was introduced to Jeff’s work through his late father Michael Shaara’s Killer Angels. While I was reading the afterward of the book, I learned Jeff was going to continue where is father left off. I was excited at the news. And when Gods and Generals came out I picked up a copy to read. I was impressed with the excellent quality of his story telling and writing. 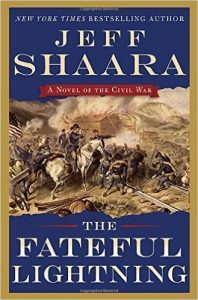 In Fateful Lightning, Jeff Shaara recounts Sherman’s March to the Sea which helped to end the war. Shaara takes what he learned from extensive research and brings to life various historical figures. In Fateful Lightning, he brings back the voices of Sherman, Hardee, Grant and other familiar figures along with introducing new voices like Franklin a former slave who along with thousands of other slaves follow Sherman’s forces throughout much of the south. Shaara also recounts the Confederate’s last ditch efforts to turn around the war. For many southerners including generals and citizens it is feasible whereas others feel the war is a lost cause choosing to desert the army and the battlefields. I was pulled into Fateful Lightning just as deeply as I had been with the other historical fiction books Shaara has published. I highly recommend Fateful Lightning; it is an extremely satisfying book that closes out his Civil War series. I look forward to learning what historical time period Shaara will write about next.